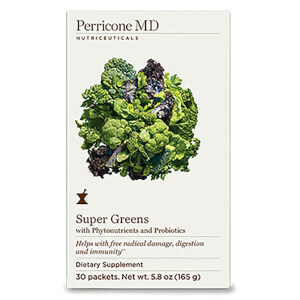 Achieve optimum levels of health with Perricone MD Super Greens Capsules, a daily drink powder that protects and replenishes the body from the inside out. 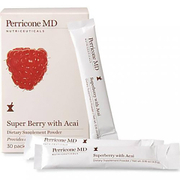 Formulated with the brand’s NRF2 Antioxidant Support Complex™, as well as a powerful group of probiotics and phytonutrients, the dietary supplement helps to strengthen the body’s natural defences and protect against harmful external pollutants. 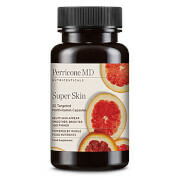 The superfood formula also cleans from within, banishing toxins to create a super-healthy, younger-looking appearance on the outside. Mix one packet with one glass of water. Drink once per day. Spirulina, Kale, Wheat Grass, Parsley, Spinach, Broccoli, Barley Grass, Chlorella, Alfalfa, Green Cabbage, Water Cress, Green Tea Leaf Extract (45% EGCG, 98% Polyphenols), Olive Leaf Extract (16% Oleuropein), Turmeric Rhizome Extract (Carcuma Longa) (95% Curcuminoids) (Carcumin C3 Complex), Broccoli Sprout Extract (Brocophane), Methylsulfonyethane (MSM) 200mg, Bacillus Coagulans, Lactobacillus Acidophilus, Bifidobacterium Lactis, L. Reuteri, Maltodoxin, Guar Gum, Malic Acid, Natural Flavours, Citric Acid, Sunflower Lecithin, Rebaudioside A, Silica, Spirulina (Colour), Apple Fruit Powder.